We wish to inform that with effect from 1 June 2018, we have changed our company name from Certification International (Singapore) Pte Ltd to SOCOTEC Certification Singapore Pte Ltd. Pursuant to the change of name, we will also be revising our certification logo to reflect our new name. If you have any queries relating to the change of company name and logo, please feel free to contact us at 6299 9001. We would like to inform that the Occupational Health and Safety Management Systems (BS OHSAS 18001:2007) was revised recently. The International Organization for Standardization (ISO) has officially published ISO 45001:2018 – Occupational Health & Safety Management Systems – Requirements with guidance for use on 12th March 2018. The stipulated transition period for ISO 45001:2018 is three years from 12th March 2018 till 11th March 2021. Therefore, as of 12th March 2021, BS OHSAS 18001:2007 shall cease. The transition to ISO 45001:2018 could take place during the initial (new), surveillance, recertification or non-routine audits. Therefore, we would advise you to make the necessary preparation to migrate to ISO 45001:2018 as soon as possible, and to coincide with your upcoming surveillance or recertification audit. The International Organization for Standardization (ISO) has officially published ISO 22000:2018 Food Safety Management Systems – Requirements for Any Organization in the Food Chain on 19 June 2018. It will replace the current ISO 22000:2005 on 29 June 2021. Companies certified to ISO 22000:2005 are given a 3-year transition period till 28 June 2021. The transition to ISO 22000:2018 could take place during initial (new), surveillance, re-certification or non-routine audits. Therefore, we would advise you to make the necessary preparation to migration to ISO 22000:2018 as soon as possible, and to coincide with your upcoming surveillance or re-certification audit. For more information on the key changes, please refer to the following link: ISO 22000:2018 Transition Kit. We would like to inform you that Hazard Analysis and Critical Control Point (HACCP) System for the Food Industry – Requirements with Guidance for Use (SS 444:2010) was revised recently. Enterprise Singapore has officially published SS 444:2018 on 6th March 2018, and the transition period from SS 444:2010 (UN) to SS 444:2018 (SAC) is three years from 6th March 2018 till 5th March 2021. Therefore, as of 6th March 2021, SS 444:2010 shall cease. With its revision, it makes SS 444:2018 a certifiable standard unlike before. Therefore, SPRING Singapore and Singapore Accreditation Council (SAC) are encouraging businesses to adopt SS 444:2018 (SAC) due to the globalization of world food’s supply whereby food safety is a critical issue. The transition to SS 444:2018 could take place during initial (new), surveillance, re-certification or non-routine audits. Therefore, we would advise you to make the necessary preparation to transit to SS 444:2018 as soon as possible, and to coincide with your upcoming surveillance or re-certification audit. For more details on the transition, please do not hesitate to contact our Sales Department at 6299 9001 ext 1. The International Organization for Standardization (ISO) has officially published Energy Management System (ISO 50001:2018) on 21st August 2018. We would like to inform that the transition period from ISO 50001:2011 to ISO 50001:2018 is three years from 21st August 2018 till 20th August 2021. Therefore, as of 21st August 2021, ISO 50001:2011 shall cease. The transition to ISO 50001:2018 could take place during initial (new), surveillance, re-certification or non-routine audits. Therefore, we would advise you to make the necessary preparation to transit to ISO 50001:2018 as soon as possible, and to coincide with you upcoming surveillance or re-certification audit. SOCOTEC Certification Singapore has great pleasure to inform that we have obtained SAC accreditation from Singapore Accreditation Council (SAC) for ISO 37001:2016 Anti-Bribery Management System. We have certified several organizations such as Surbana Jurong Private Limited, RMA Contracts, Keppel Offshore & Marine Limited, etc. SOCOTEC Certification Singapore was gratified to certify its first Asset Management System (ISO 55001:2014) client, Land Transport Authority of Singapore (LTA) since 28th November 2017. By adopting asset management standard, LTA can ensure effective governance of its assets by continual improvement and on-going value creation. 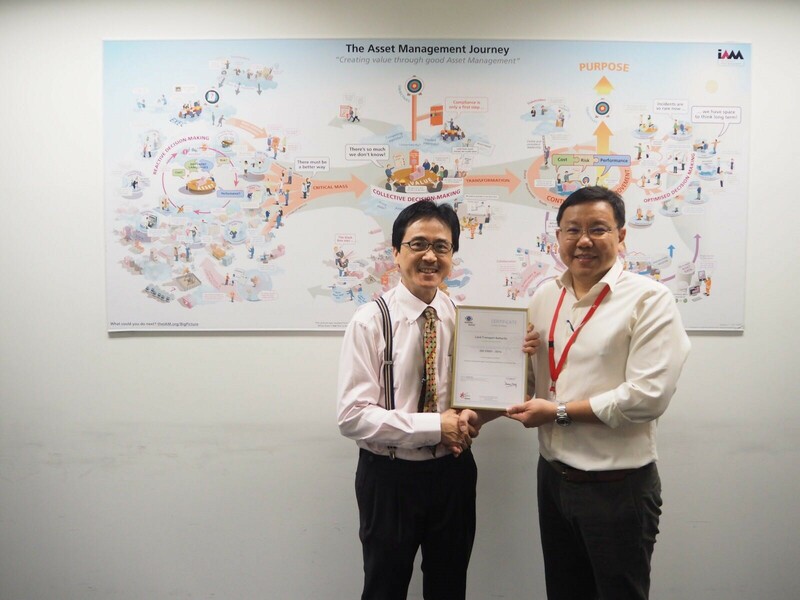 LTA was presented with ISO 55001 certificate on 29th December 2017, with the attendance of Mr. Dave Cheng, CIS Managing Director alongside, Mr. Leow Meng Fai, Director, Assets Condition Standard representing LTA. SOCOTEC Certification Singapore has great pleasure to certify Microsoft Corporation for Multi-Tiered Cloud Computing Security Management System (SS 584:2015) IaaS and SaaS Tier 3 certification since 22nd September 2017. By adopting MTCS standard, Microsoft Corporation can provide its clients with greater clarity on the levels of security offered by their cloud computing services. 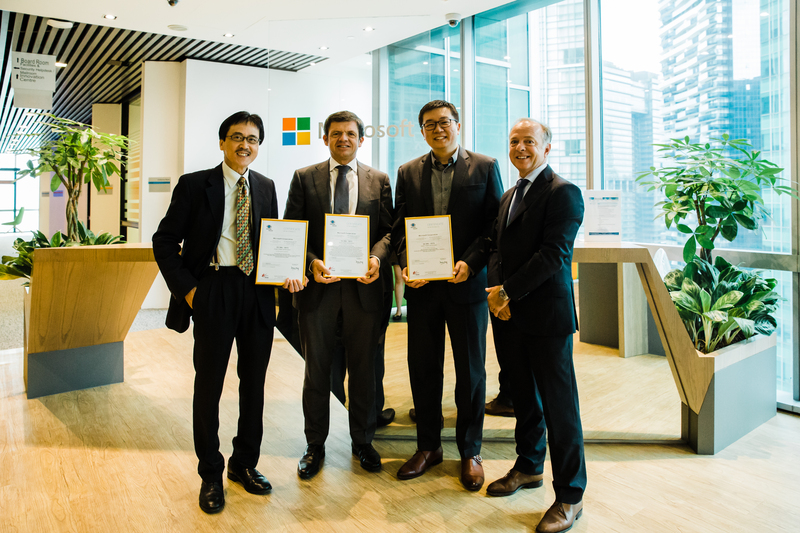 Microsoft Corporation was presented with MTCS Level 3 certificates on 12th October 2017, with the attendance of Mr. Hervé Montjotin, Chief Executive Officer of SOCOTEC, Mr. Jean-Marc Fort, Executive Vice President, Mr. Xavier Daniel, Certification Business Unit Director and Mr. Dave Cheng, CIS Local Managing Director alongside, Mr. Richard Koh, Chief Technology Officer Singapore representing Microsoft Corporation. AS 9100 Quality Management Systems – Requirements for aviation, space and defense organizations is undergoing a major revision. The draft standard has been approved by the International Aerospace Quality Group (IAQG) in April 2016 and will be officially published in September/ October 2016. The transition period for AS 9100 is until 14th September 2018. Therefore, as of 15th September 2018, the current AS 9100 standard will cease.